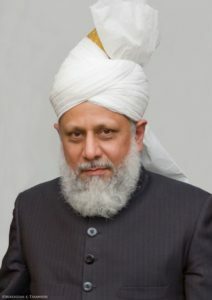 Hazrat Mirza Masroor Ahmad , Khalifatul Masih Vth. You can send a letter to our dearest Huzoor through here. Prepare a rough write-up, keep it handy. Please fill all the required fields, especially Address field. From the very beginning, Allah has been sending His Prophets to mankind, to inform them of their purpose in life – to worship the One God, that through worshiping God and following God’s ways, mankind can attain righteousness and attain spiritual prosperity and progress. To ensure the message of the Prophet continues and there is a strong body of believers, Allah has also set up a heavenly system of leadership which is called Khilafat (sometimes spelt Caliphate). Khilafat means successor and after the prophet, a successor or Khalifa continues his work guiding and developing the believers. It is a wonderful bounty of Allah, which ensures unity of believers and enables the believers to continue to do righteous deeds and to serve God and mankind. They will worship Me, and they will not associate anything with Me. This pattern was continued with the inception of Islam, the universal religion for all mankind. Allah sent to the believers, the Holy Prophet may peace and blessings of Allah be upon him, who was the most excellent exemplar and who established the Unity of God and showed us how to follow the path to God. In his lifetime, he completely fulfilled his mission and taught us the Islamic faith and how to worship Allah. After he passed away, Allah established the system of Khilafat. Khilafat is a successor after the prophet in the form of a person who represents the deceased prophet and the Khalifa is the vicegerent and his subordinate. He is the central authority. This is the basic principle of Khilafat. All Muslims understand its need as well as importance. This need was felt after the sad demise of the Holy Prophet may peace and blessings of Allah be upon him. Islam is based on unity, the belief of One God and brotherhood. This unity can only be maintained as long as there is only one Imam (leader) for the entire Muslim nation. Khilafat provides us with a system to have one Imam for the entire Ummah (Muslim nation). It is therefore understood from the Qur’anic verse above that whenever the Muslims cease to have only one Imam among them, Khilafat will be taken away from them. ‘O Muslims! This prophethood will remain with you as long as Allah wishes it to remain. Then it would come to an end, to be replaced with Khilafat which would be on the pattern of prophethood, and would remain as long as Allah wills. Then this Khilafat would also come to an end. Then there will be Kingship and will remain as long as Allah wills. Then there will be the rule of the oppressors and that period too will come to an end. After saying this, the Holy Prophet may peace and blessings of Allah be upon him said no more, which indicates that this new Khilafat would continue till the Day of Judgement. In accordance with the prophecy of the Holy Prophet may peace and blessings of Allah be upon him, after the end of his prophethood, Allah established Khilafat on the pattern of prophethood. This is referred to as Khilafat-e-Rashidah (rightly-guided Khilafat). This lasted for just thirty years (from 632AD to 661AD), but during that time, Islam gloriously spread not only all over Arabia, but as far and wide as Persia, Syria, Cyprus and Northern Africa. As the prophecy then continues, this Khilafat-e-Rashidah was followed by Khilafat which lost its spiritual guidance (the pattern of prophethood) and became worldly Kingship. This Kingship eventually became corrupted and the rule of the oppressors took over. Islam entered into a very dark period. But Allah would not leave it in such a state. As the prophecy finishes, ‘Khilafat on the pattern of prophethood, would re-emerge. Allah Almighty raised the Reformer of the Latter Days – the Leader, the Imam, the Saviour, the Guided One, raised to the status of the Promised Messiahmay peace be upon him, who we believe was Hazrat Mirza Ghulam Ahmad, the Promised Messiah and Mahdi. He claimed to be that person – the Promised One – who is awaited by all the religions to guide mankind back to God. He was bestowed these titles through his immense love for God and the Holy Prophet may peace and blessings of Allah be upon him. As the Promised Messiah he is the spiritual reflection of Jesus, displaying his teachings of ‘love and forgiveness’. As the Mahdi he is the spiritual reflection of Holy Prophet may peace and blessings of Allah be upon him, displaying the true teachings of Islam. He was given the duty to unite all of mankind under the one chosen religion of God – Islam. The purpose of his coming was: the revival of Islam and enforcement of its teachings, its law, its rules and regulations, to ensure the spiritual and moral prosperity of Muslims. His work is now being continued through his Khalifahs who lead his community to be true followers of Islam. When Allah raises someone to the status of Khilafat, He also blesses his prayers with assured acceptance. In fact, the supplications of the Khalifa are more powerful than the prayer of any other individual. With this great blessing of Khilafat, the believers have protection, stability, spiritual strength and progress of Islam. It is very important to keep a strong link with Huzoor, write, visit, pray behind, listen carefully to his guidance and advice and say ‘Labak’ (at your service) to whatever he asks us to do. The objectives of the mission of Promised Messiah and of the establishment of the Community were to establish the relationship between God and man, to teach mankind to submit to one God, to strive for establishing Tauhid (Oneness of God) in the world, and, having united all the nations of the world into one Community, gather the whole mankind under the banner of the Holy Prophet and to draw the attention of mankind to recognizing and respecting the mutual rights of man. We are very pleased to have celebrated over 100 years of Khilafat. May Allah continue to keep the Blessings of Khilafat forever, Ameen. Every year during Jalsa Salana UK, we have the blessed opportunity to do the Bai’at with our Beloved Khalifa. We all should have renewed our Bai’at with him. When we take the Bai’at at the hand of the Khalifa, in fact we are doing it with the Promised Messiah may peace be upon him – to whom the Khalifa is representing. In fact we are doing it with the Holy Prophet may peace and blessings of Allah be upon him – to whom the Promised Messiah may peace be upon him is representing. In fact we are doing it with Allah – to whom the Holy Prophet may peace and blessings of Allah be upon him is representing. Therefore, when we do the Bai’at we are actually taking it with Allah. The primary function of a Khalifa is to carry the message of the Prophet into the future without losing the spirit of the message. This task is best accomplished when the community is united and strong, and the community cannot be united and strong without the Institution of Khilafat. Moreover, it is the responsibility of the Khalifa to admonish us with the help of Allah to stay on the right path. So this is the blessings and need of a Khalifa, that they bring unity, harmony and guidance. This is what Islamic teaching centres on, without unity and harmony you cannot follow the teachings properly. When a Muslim goes to the mosque for his prayers five times a day, there must be an Imam. Standing behind an Imam is a demonstration of unity among people. That is why the Holy Qur’an especially emphasises the need of congregational prayer. The Imam is given so much importance that if the Imam falters, the entire congregation must follow his mistake even if they know that a mistake has been committed. What better instance can be presented for the need of an Imam and unity in his following? If an Imam is so important in a small mosque, then how can the whole Muslim Ummah (Muslim Nation) survive without an Imam? As far as the Ummah is concerned, they are commanded to turn their faces towards the Qiblah – Mecca. For the Muslims throughout the world, there is one and only one Qiblah. You may go anywhere in the world but the Qiblah remains the same. Another wonderful display of unity. So likewise, it is important for the Muslims to be united under one Imam. If this was not the case, then there would have been no Khilafat at all because the spiritual condition of Muslims in the days of the Holy Prophet may peace and blessings of Allah be upon him was a thousand times better than the Muslims of today. If they need to follow an Imam, how can we live without an Imam today when the condition of Muslims is crying for it? This is why Khilafat is needed. Today, the world can witness that by Allah’s grace, Ahmadiyyat is constantly being blessed with Allah’s help and guidance. Under the Divine blessings of Khilafat, the Jama’at is progressing in every direction. The Community is well established in over 200 countries of the world and the community has translated and published the Holy Qur’an in over 72 different languages. Similarly, through the blessings of Khilafat, the Community has built thousands of mosques throughout the world and that number is growing rapidly. It has striven to serve humanitythroughout the world by building and opening hospitals, schools, training centres as we carry out our motto of ‘Love for All, Hatred for None’.